A quick and easy rustic tart is a great option for a spring brunch, but fancy enough for a dinner party. 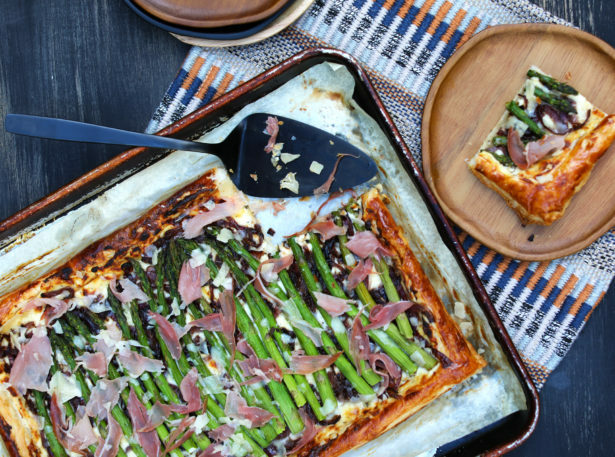 Using store bought puff pastry makes the perfect vehicle for creamy cow’s milk ricotta paired with nutty Gouda cheese, sweet caramelized onions and spring asparagus stalks. Heat butter in large skillet over medium heat. Add sliced onions and cook until soft and caramelized, about 10 minutes. Remove from heat and set aside. In medium mixing bowl combine cheeses and next four ingredients. Mix together thoroughly; set aside. Spoon the cheese mixture over the dough inside the scored edges, spreading out to an even layer. Top with caramelized onions in a uniform layer. Lay asparagus stalks side-by-side over the cheese and onions, pressing down gently into mixture. Brush edges with egg wash.
Bake for 20-22 minutes, or until crust is golden and edges are puffed up. Remove from oven and top with torn pieces of prosciutto. Garnish with fresh basil. Cut into 12 squares. Garnish with fresh parmesan cheese if desired.